If you like your culture with a dash of comfort, or your peace with a little quiet, then Japan is the name of your travel game. Japan felt like an oasis in the middle of crazy, chaotic Asia, and we found a lot of similarities between the culture here and the one we fell in love with in Taiwan. Over here at 12FOOT3, Jeremy is the nature lover and I’m the culture vulture, and Japan has got enough to keep us both happy. From fashion, art, style, and design in Tokyo to forests, flowers, and bamboo in Koyasan, (or the intersection of nature and culture in Naoshima), Japan has got it all. Go, and let us know what you think. We’re pretty sure you’ll love it too. View of Tokyo Tower from the Mori building. The Japanese countryside, somewhere between Osaka and Naoshima. Highlights: There wasn’t a place we didn’t like: Tokyo, Kyoto, Koyasan, Naoshima, Takayama—each big city or little town was fabulous in its* own way. Shirahama was a bit resort-y for our tastes, but since we were there before the start of the “official” beach season, it was empty and quiet. That, and the fabulous onsen on the beach, made it worth the trip. 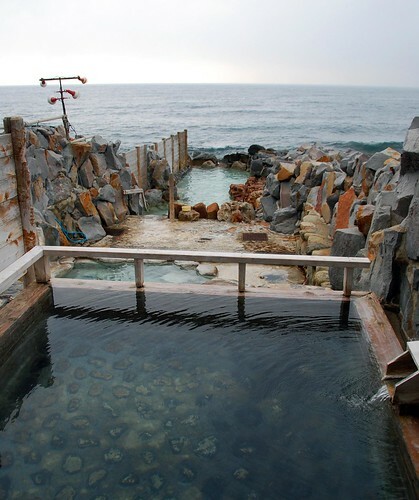 Sakino-yu onsen in Shirahama. The Pacific Ocean crashes over the wall into the cold pool. Places we would like to visit next time: For us, it’s less about where we’ll go next time and more about when we’ll go. We’ll gladly return to Japan in spring (cherry blossom season), autumn (fall colors painting the Japanese maples), or winter (snow sitting on temple rooftops). A taste of what autumn in Japan might look like. 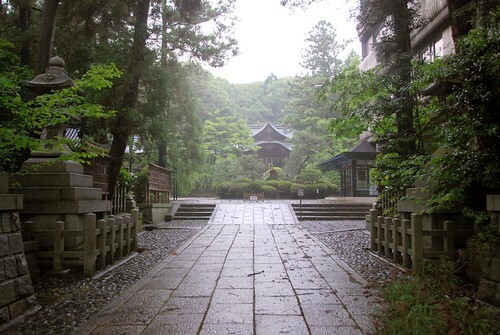 Taken in Okunoin cemetery, Koyasan. Prices: Yup, Japan is expensive. Food is expensive, accommodation is expensive (see the accommodation section below to find out why), and public transport is…guess what? Expensive. In return for parting with your hard-earned cash, you get fabulous food, a high level of comfort and cleanliness in the guest houses, and some of the fastest, easiest, and most convenient transport experiences you can find in this world. In other words, you get what you pay for in Japan. But be prepared to pay a lot. Weather: We were traveling in Japan during the supposed “rainy season” (June), though it only rained hard twice (and then boy did it rain!). Most days were overcast, humid, but not too hot (maybe mid-70s to 80s?). Japanese Person: Irashaimase! Tekka tekka tekka tekka tekka HAI! Tekka HAI! Tekka tekka tekka HAI! * I had to learn this phrase immediately upon leaving Tokyo. ** Japanese people make the most amazing sound effects. One thing I forgot to mention in my food post—some of you are probably wondering what the deal is with the $40 melon or the $60 grapes you hear so much about. It’s not like Japanese people have to take out a second mortgage in order to eat fruit. Rather, these are gift items—a $40 melon is a token that shows your appreciation for the receiver of said fruit. See, everyone knows that THAT is the $40 melon, and the receiver will know it too. 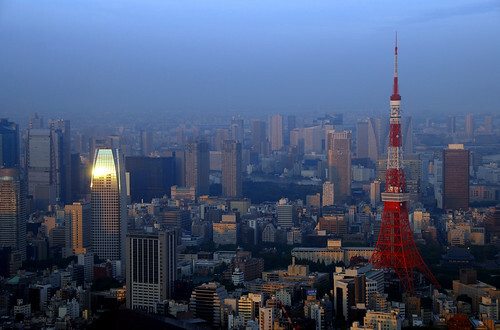 Accommodation: A big chunk of your travel budget in Japan will go towards accommodation. Why? Well, in Japan, rather than paying for a room, you pay by the person. So if you are a single person traveling, you might get a room to yourself for ¥4000 (about US$40). But a couple staying in a similar room will have to pay ¥8000. That’s just the way they do things in Japan. Them’s the breaks. 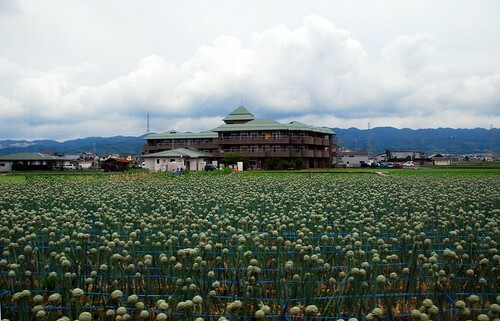 Budget places tend to run between ¥3000 to ¥4000 (US$30-40) per person per night. So even a budget hotel will cost a couple US$80 per night. For that reason, Tokyo and Kyoto are a good place to try to use miles on hotels if your mileage program will let you do so, because housing is extra expensive in the big cities. You can also try JAPANiCAN, which often has great deals on accommodation. A typical Japanese-style room (though this one is quite spacious). If you’re traveling on a budget, you’ll want to look for shukubo (temple lodgings), kokumin shukusha (”people’s lodges”), and minshuku (the Japanese version of bed and breakfast, downmarket from the fabulous ryokan). Sometimes a minshuku will offer you a choice of Western or Japanese-style room. 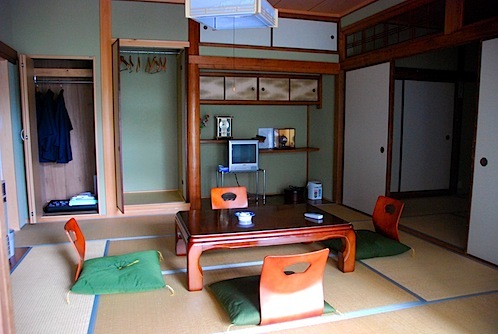 We always opted for the Japanese-style accommodation, which means your room will have tatami mats, a small coffee table surrounded by cushions or chairs (like the one pictured above), your bed will be a futon mattress stored in the closet and brought out at night, and your pillow will be stuffed with buckwheat. Again, despite the high costs, you will get quality from Japanese hotels and guest houses—your room will come with a cute kimono-style robe, a tea set and hot water heater, and (if you stay in the Super Hotel in Kyoto) your choice of pillows (buckwheat, memory foam, or feather, of different densities and thicknesses). Plus a little Japanese atmosphere to boot if you choose the local style accommodation. Transit: Japan’s national rail system is really, really amazing. You can get to every corner of the country…and often at no additional cost if you spring for the JR Rail Pass. Granted, the pass is not cheap, but you definitely get what you pay for. 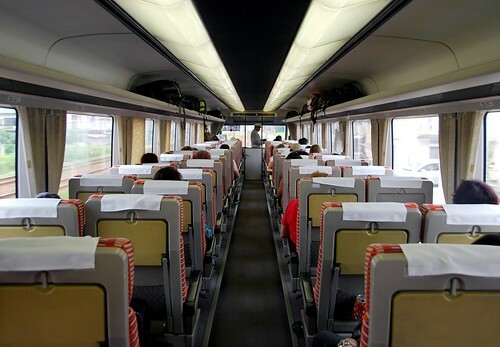 The trains are super fast, efficient, ultra clean, and comfortable. On the train from Takayama to Tokyo. 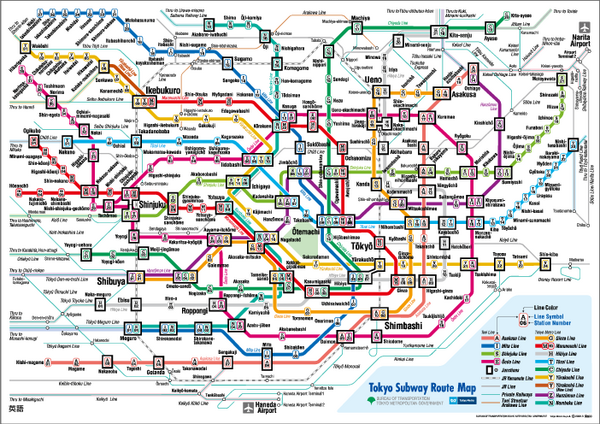 I know that Tokyo’s Metro is supposedly a transit lover’s dream come true, but we found it hard to navigate at times (seriously, the maps look like a pile of multi-colored noodles!). Internet: As we’ve come to find on our travels so far, Japan adheres to the unwritten international commandment of “developed countries shall be stingy with their wifi.” If our guest house did not have wifi, we could sometimes find an unlocked connection on the street. Of course, my iPod Touch chose to break down in this country, which made it even harder to keep up with friends and family back home. I ended up buying a new iTouch in Tokyo (interestingly, one of the cheapest places in the world to get one…but only by a little bit). 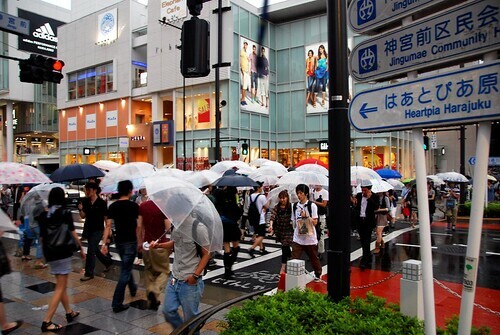 Culture: What you’ve heard about Japan is true—people are exceedingly polite. But Japan is also a rules-based society, and as our hosts Joy and Alex explained, you can ask a person for directions and they are so polite that they walk you to your destination—but ask them to do anything (ANYTHING!) that is against the rules or the process, and you’re in for a long struggle. Put the mustard on the side? Substitute lettuce for tomato? I don’t think so, Mr. Big Shot Rule-Breaker Man! The problem is, again, Japanese people are so polite that they won’t just come right out and say “no.” Instead, they’ll talk around it…you’ll get answers like: “that might be difficult” or “um, I will need to ask if that is possible.” This cultural trait generally does not affect visitors much, but I imagine if you are a Westerner working in Japan (as Joy and Alex are), this can be really frustrating. 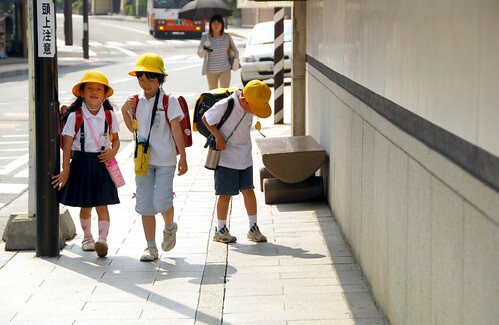 Schoolkids in Koyasan. Don’t they already look like good citizens? The other insight our ex-pat friends shared with us: you don’t want to be around when a repressed Japanese person finally goes postal. Japan is exceedingly safe, but Joy admitted that the one time she ever feels scared in Japan is when someone is losing it. We saw a guy in Tokyo try to run another guy over at least 3 times (they were having some sort of argument). The point of this “game” is to pop the other kids’ balloons mounted on their side of their helmet. WITH A STICK. About 12 seconds into the video, you can see one kid fall down and then all all the other kids start wailing on him/her. I got all this from the Wiki entry so it MUST be true. In short: It’s really, really lovely in Japan. Here’s a convoluted statement for you: there are many reasons why Kyoto is amazing, and one of those reasons is simply because there are so many reasons! To clarify: the variety of things to do and environments to explore in this city is just astonishing. Urban life? Check. Temples? We covered that in the last post. Gardens? Yessiree. Markets? You betcha. Castles? Heck Yeah. Public parks? Yup. Good food? Well, of course, it’s Japan! 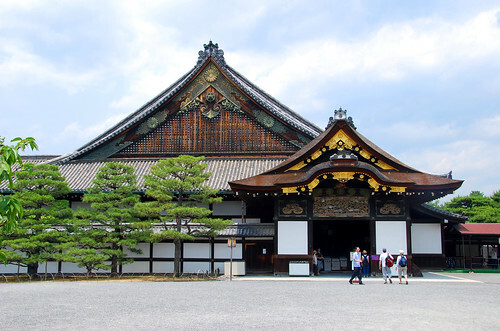 One of the (many) cool things we saw in Kyoto was Nijo-jo Castle. There really is something ancient about the place, and walking through the castle and grounds makes you feel like you’ve traveled back through time as an old Shogun. 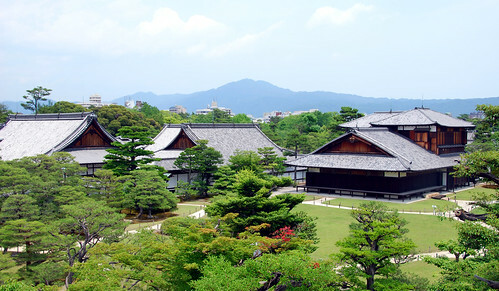 After experiencing Kyoto of the past, you can check out it’s present. Nishiki food market is a fun place to wile away an afternoon, checking out all the amazing foodstuffs that Japan has to offer. We ate tofu donuts (good! ), saw hundreds of different types of Japanese pickles, and gawked at knives that cost more than some peoples’ monthly rent in San Francisco. 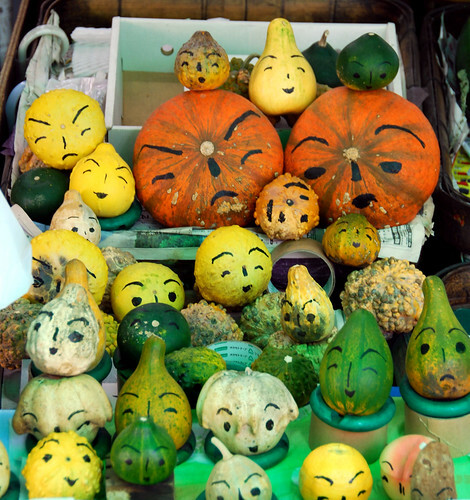 The many faces of squash. 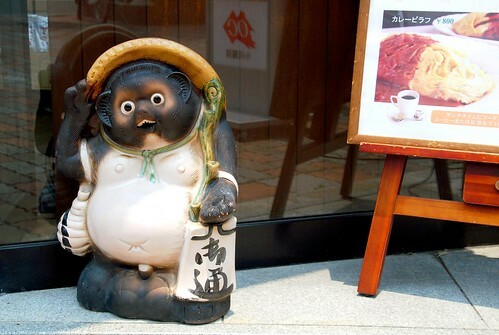 Taken in Kyoto’s Nishiki food market. 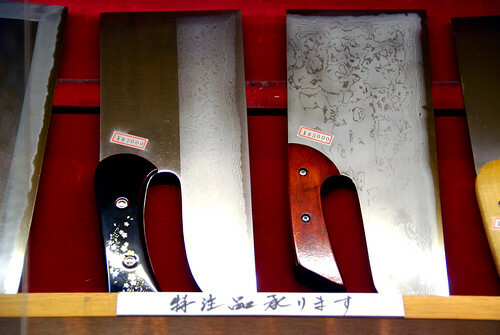 OK, this particular photo was taken in Tokyo, but we saw similar knives in Kyoto. These bad boys are specifically made to cut noodles. 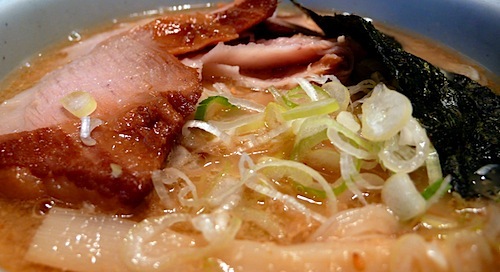 And at 84,000 yen a pop (about US$840), you’d have to cut a LOT of noodles to make this purchase worthwhile. 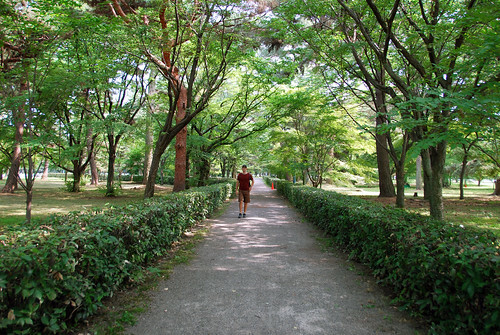 For an already green city, Kyoto also has some beautiful parks, where you can enjoy even more greenery. 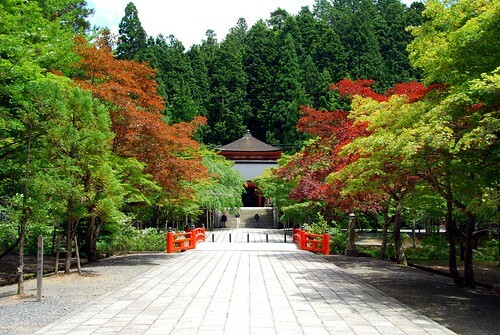 I can only imagine how jaw-droppingly beautiful Kyoto would be when the leaves are turning in the fall. Jeremy and I have already decided that we need to come back in the autumn (when all the Japanese maple leaves turn red), in the spring (when the cherry blossoms go off), and in the winter (when everything is covered in a blanket of white). Strolling through the Imperial Palace Park. 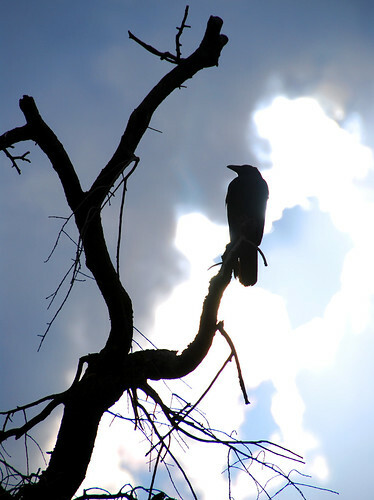 There are ravens all over Japan. This one was perched at the top of a famous cherry tree in the middle of Maruyama Park—a tree that is apparently so beautiful when it blossoms that you have to view it from the hills in the back of the park because there are so many visitors mobbing the area. Unfortunately, the tree was looking kind of sad when we were there (in the summer). Since we no longer had the benefit of a place to stay in Kyoto, we had to watch our budget a little more closely when it came to food. This turned out not to be too much of a problem, since there are some incredible (and affordable) ramen joints in Kyoto. Our favorite was a place called Santoka, which had a surprisingly hip and modern interior. But it wasn’t the decor that kept us coming back for more…it was the pork cheeks. Behold this bowl full of fatty, delicious beauty!!! 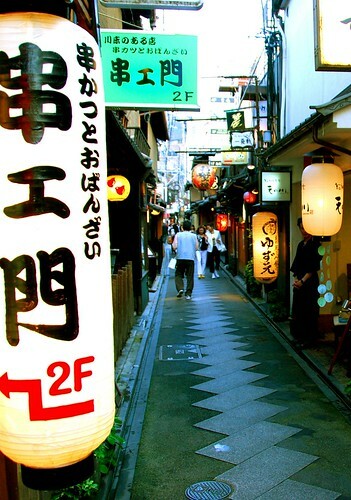 Pontocho Street, where Geisha often entertain at night in the exclusive clubs. 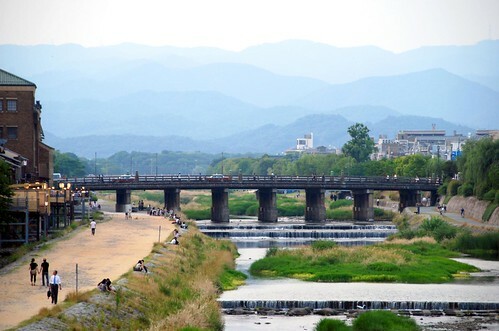 The Kamo River…look at those mountains in the background! …or wandering in and out of temples. In short, we love Kyoto. Maybe we’ll see you here next fall…or winter…or spring…or…? Picture it: It’s sundown, and Hope and Jeremy are walking down a Hanamikoji, a ridiculously picturesque cobblestone street in Kyoto. The street is lined with tea houses and exclusive restaurants, and all of the buildings are constructed in the traditional Japanese style, with thin wood slats backed by rice paper screens. Hand-dyed noren (Japanese split door curtains) flap in the slight breeze, exposing tatami-matted interiors where geisha entertain Japanese businessmen until the wee hours of the morn. 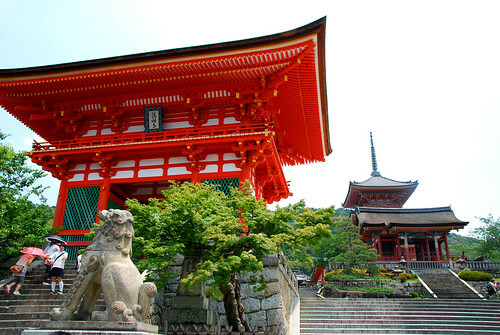 Hope: Can you believe how gorgeous Kyoto is?!? Jeremy: Yeah, it really is. And that’s how I missed our one and only geisha sighting in Kyoto. We were completely set up for the shot—she was walking directly towards us, and had I been paying attention, rather than looking at the menu (the stupid menu! ), I would have been able to take at least 2 photos of her before she passed. Yes, it was very depressing, but I felt even more sad for the poor geisha, who had at least 5 tourists literally running after her, trying to take her photo. This made me feel better about not getting my own shot—the poor gal probably feels that she’s been documented enough, thankyouverymuch. Oh well, on the bright side, it’s hard to stay depressed in Kyoto. Man, is it beautiful here! To be fair, Kyoto is a big city, so if you ever make it out this neck of the planet, don’t expect to step off the train and into a scene like the one described above. You do have to deal with a bit of urban sprawl. But the delightful thing about Kyoto is that between all those congested city streets is a charming and vibrant town of cobblestoned pedestrian walkways, Japanese teahouses, and a myriad of other cultural treasures, just waiting to be discovered. For a big city, Kyoto feels like an intimate little town, and a quaint and traditional one at that. 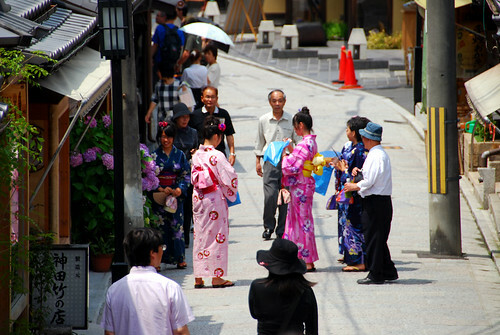 Women in yukata (summer kimono) walking on one of Kyoto’s most atmospheric streets, Sannen-zaka. 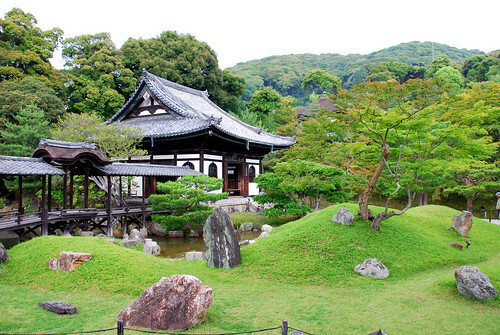 Temple-exploring is the name of the game in Kyoto, and we were happy to oblige. One of the most famous temples in Kyoto, Kiyomizu-dera. 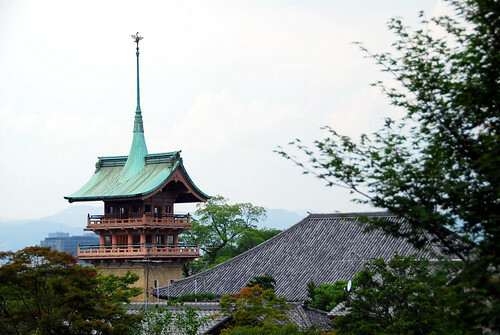 Perched in the eastern Higashiyama mountains, it offers gorgeous views of the city. It has been really cool to see the differences between Buddhism across Asia, and how local culture gets infused into the architecture of the temples and the way in which people worship. Japanese temples are all about natural wood highlighted with gold accents—compare this with highly decorated Chinese Buddhist temples (like Kek Lok Si Temple in Malaysia), or the gilded surfaces of Laotian temples (like those in Luang Prabang), and you’ll see how differently Buddhist devotion is expressed across this continent. I have to say, the natural wood and simplicity of Japanese temples is really quite appealing, and makes the few gilded surfaces and colorful accents stand out more since there isn’t SO much to look at. 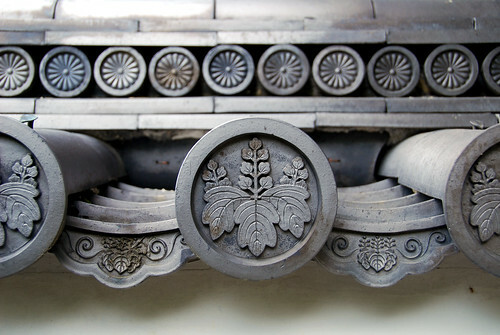 Detail of a temple’s roof tiles. 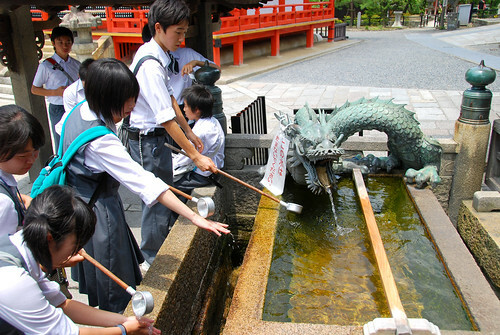 Schoolkids washing their hands before entering Kiyomizudera. 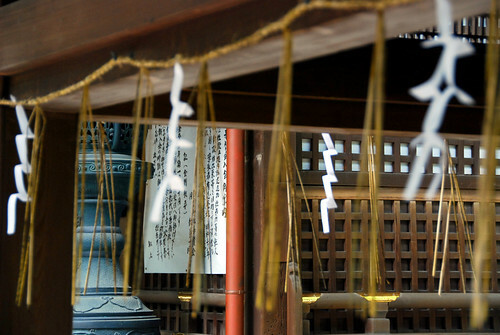 Second, there seems to be some sort of bell-ringing ritual in Japan…usually a bell is hung at the top of an altar, with thick, beautiful rope running from the bell all the way to the floor. Worshippers can ring this bell (usually after they throw a coin into a slotted donation box). This is pretty different from other Buddhist worship we’ve seen, where bell ringing seems to be done exclusively by monks. 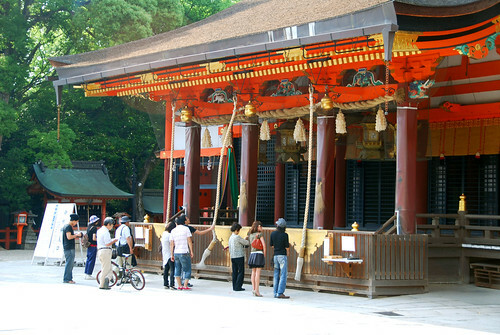 Worshippers ringing the bell in front of Yasaka-jinja. We also see these folded paper strips dangling off the roofs of many temples…and they are so beautiful and simple that it seems like there must be some sort of metaphor behind them. 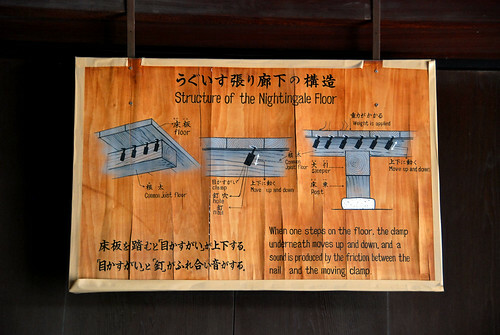 Folded paper strips hanging off the roof of a small shrine we encountered in the middle of the Imperial Palace Park. Finally, we’re not sure what this is all about, but Japanese people put little aprons (and sometimes wee little hats) on all the stone figures scattered around a temples’ grounds. Are they trying to clothe the statues so they aren’t hanging out there in the open with everything exposed? Keep them warm? We have no idea! But it’s pretty cute, and delightfully Japanese. 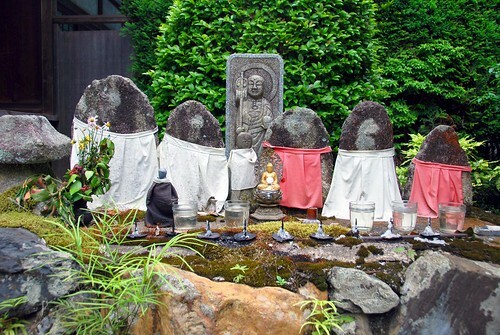 Stone figures covered modestly in aprons near Kotoku-an. But Kyoto isn’t only about temples…there are also some incredible gardens that you can stroll through, admiring the beauty and appreciating the silence. 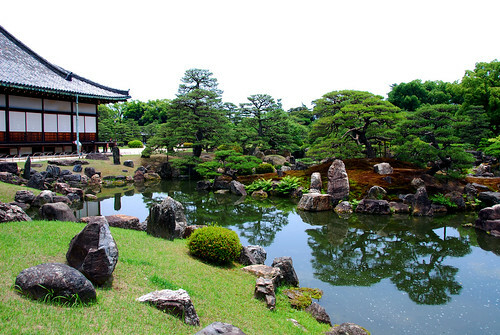 The gardens outside of Nijo-jo Castle. 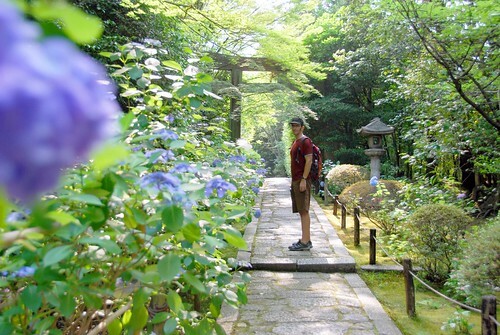 We were in Japan while the hydrangeas were going off, shown here in the gardens of Konchi-in. If the temples and gardens weren’t enough to make your heart skip a beat, the city is freakin’ gorgeous too. 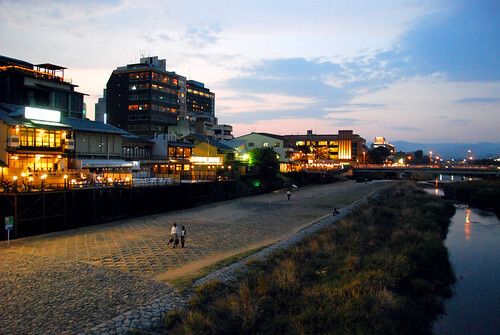 Most nights, we walked along the Kamo River around sunset, which has tons of outdoor restaurants/bars lining it’s western bank. If, like us, you don’t want to pay the inflated prices along this picturesque stretch of water, you can stroll along it’s pedestrian pathway, watching egrets and crows bathe themselves in the river waters. OK, I just wrote a book and I have barely covered half of what we did in Kyoto! But I’ll happily continue on in a second post…I’m enjoying reliving our memories of this place (hopefully) as much as you are.